Summer is always welcome at our home for waifs and strays and no-one loves it more than the hens, especially the ones that have never seen sunshine before. Not only do they glory in sunbathing, but they love nothing better than to take a dust-bath. They scratch and bill-rake the ground before stretching out their feathers and squatting in the dust. Then begins the vertical wing-shaking, head rubbing and scratching themselves with one leg, it’s fascinating to watch, if you’re that way inclined. It’s all in a good cause, to clean their feathers and remove any irritating parasites. I sometimes think I should take a leaf out of their book and do the same thing. If only it were that easy to remove irritating people from our own skin! Well moving swiftly on, it is interesting to note that even battery hens feel the need to dust-bath even without any dust. They will struggle to clean themselves in the bits of food that has fallen from their feeding troughs. This is called sham-dusting. It is disgraceful that we treat these animals in such a way that they are denied washing facilities. A basic need for all animals, including us! 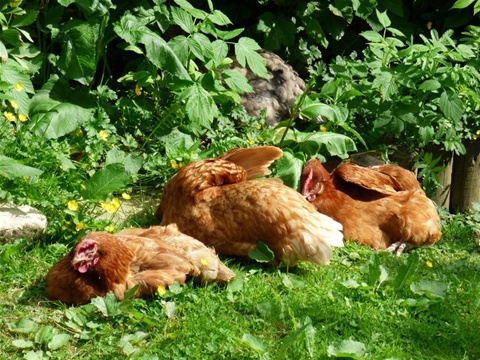 But here at our home for waifs and strays, these rescued hens have all the mod cons, such as earth, grass, rain and sunshine. Everything they need for a better quality of life. A life they deserve!